Recent research suggests that 44% of Canadian bird species are declining; including one-third of the species found in the Maritimes. 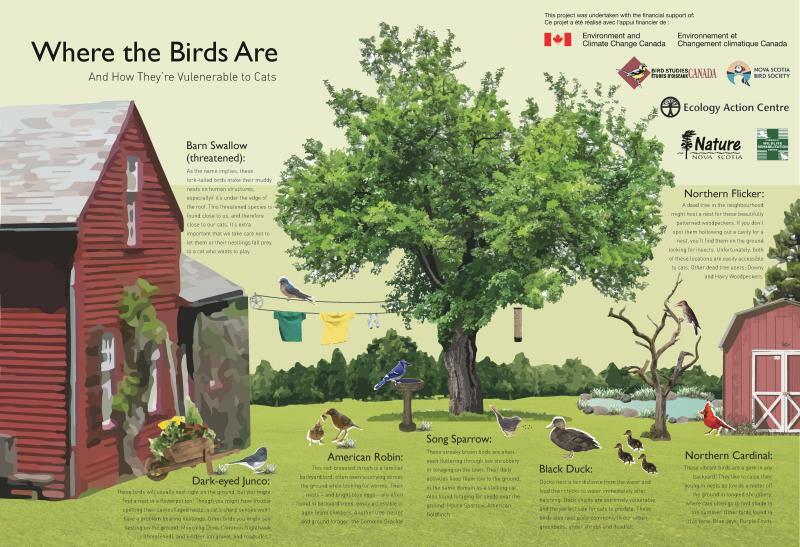 Habitat loss, pollution, climate change and outdoor cats all negatively affect our bird populations. At Ecology Action Centre, our Bird Conservation Committee works to educate the public about preventable causes of bird death and to advocate for legislative change that will help protect local bird populations. But there are also steps that you can take to help protect birds every day. 2. Take action by supporting local movements to adopt Responsible Pet Ownership guidelines that benefit cats and birds. Seventeen of the 20 most populous municipalities across Canada include provisions for cats in the municipal policy framework. Send a letter to your municipality to urge them to act to keep cats safe and save bird lives. 4. Don't use cosmetic pesticides. Support a province-wide ban on cosmetic pesticides as Ontario and Quebec have done. Follow up by creating bird habitat by planting bird-friendly native species. 5. Reduce outdoor night lights as they can be a problem for light-sensitive birds such as storm petrels. 6. Encourage the Government of Nova Scotia to protect 12% of the province as promised in the Environmental Goals and Sustainable Prosperity Act. 7. Most shorebirds are in serious decline. Support the development of a provincial coastal strategy which protects birds and their habitat. When on the beach make sure you and your pets don’t disturb the birds. 8. Millions of birds are killed in each year as a result of colliding with the windows of buildings, big and small. Make sure your home or office is not killing birds. There are lots of great tips for bird-proofing your windows here. 9. Ensure your coffee is from bird-friendly sources and produced using farming practices which help conserve songbird and migratory bird habitat. 10. Share this information with friends! Our project aims to increase awareness about the impact that outdoor cats have on birds, as well as actions we can take to promote healthy communities that benefit our native wildlife.